The Allies had made an amphibious landing at Anzio in January 1944, with the aim of outflanking the German Gustav line near Cassino and facilitating the capture of Rome. After consolidating the bridgehead the British 1st Infantry Division pushed up the road from Anzio to Campoleone to create a narrow salient. Vulnerable to counter attack the salient was eliminated in a German counter offensive and 1st Division, with 168 Infantry Brigade under command, took up a new, more defensible line in front of Carroceto. The enemy renewed its attack during the night of 7-8 February. 192 Battery sailed from Naples docks on the morning of 2 February 1944 and, after a calm voyage in good weather, arrived off Anzio at midday. After unloading the Battery moved to an assembly area on a track near the main Anzio-Carroceto road. Spasmodic shelling throughout the night caused one casualty. 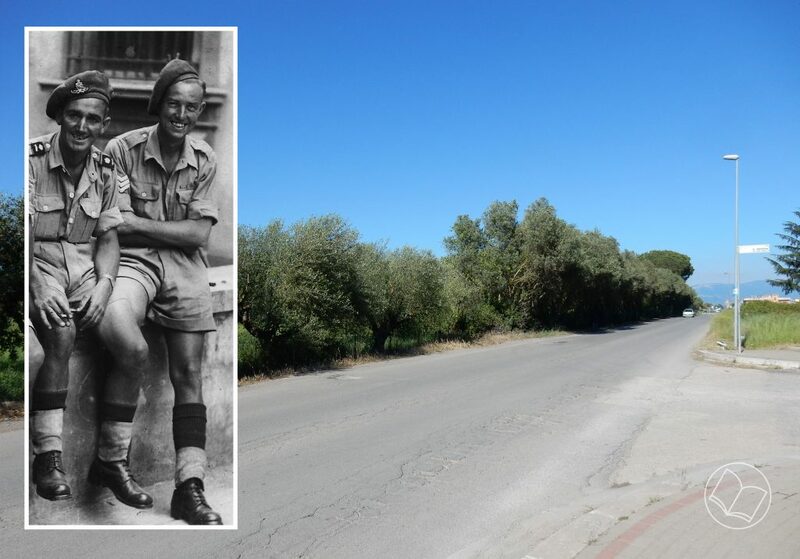 The intended role for 168 Brigade was to take up positions on a Corps reserve stop line astride the road in the area of the ‘fly-over’ bridge at Campo di Carne. The Battery moved to this position on the 4th, digging in its guns to cover the road. Owing to the serious situation developing in the forward area, however, the Brigade was sent forward almost at once to occupy a section of the front line with Major Chapman being given responsibility for co-ordinating the anti-tank layout in the area. On the night of 7 February two 6-pounder guns of N Troop, N3 (Sergeant N. Pullin) and N4 (Sergeant R.D. 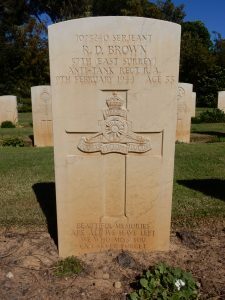 Brown), took over positions from the 81st Anti-Tank Regiment, R.A. in support of the left forward Company of the 10th Royal Berkshire Regiment. The positions were on the road running north east from Carroceto and Aprilia. Throughout the night the enemy put in a series of attacks from the east and north against the Royal Berkshires which were just held, although the forward companies suffered heavily. Both gun teams fought as infantry sections. The next day was relatively quiet, but three enemy tanks were spotted in the wood on the other side of the road. In the afternoon two Sherman tanks came forward and one of the enemy tanks moved into position on the right leading edge of the wood to engage them. In addition to the Shermans’ gunfire, Sergeant Brown fired six rounds and after the Shermans withdrew no movement was seen round the German tank which stayed on the edge of the wood. After midnight, the German attack was renewed and once again the fighting went on throughout the night. At first light on 9 February a Sherman tank moved up to assist in dislodging the enemy from a house on the opposite side of the road. The citation for Sergeant Pullin’s Military Medal states: Without hesitation he led a party of infantry forward behind this tank, the enemy was cleared from the house and 15 prisoners were taken. The citation adds: Showing considerable coolness Sergeant Pullin remained in this position throughout daylight on 9 February, although shelled by our own artillery and no longer supported by infantry. At dusk, there being no further hope of saving the gun, Sergeant Pullin removed and buried the firing mechanism and, through his own courage and initiative, succeeded in bringing his detachment through the enemy lines to safety. The Germans now occupied the forward positions, but their attack petered out during the day and the front line just about remained intact, although the Royal Berkshires were sadly reduced in numbers. On the 11th the guns of the Battery were withdrawn apart from one Troop which stayed in position for another four days. The Battery then moved to occupy positions on a stop line on the Fosse della Caffarella on the left sector of the Anzio beachhead. It would remain in the beachhead for over three months and did not rejoin the Regiment until 28 June.